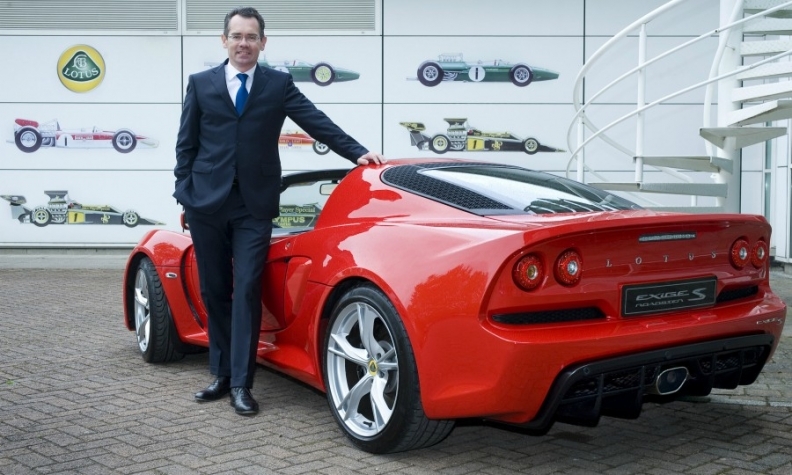 Lotus boss Jean-Marc Gales sees a lightweight crossover joining the automaker's lineup. It has been a momentous year for Lotus. Volvo Cars-owner Zhejiang Geely Holding bought a majority stake in the British sports car maker, ending the uncertainty over its future under former Malaysian owner, DRB-Hicom. CEO Jean-Marc Gales, who has spent the last three years fighting to stabilize Lotus' weak finances, said of the company's new Chinese owners: "It is the best thing that could have happened to us." He explained why he's confident that Lotus is ready to enter the premium SUV sector in an interview with Automotive News Europe Correspondent Nick Gibbs. Where does Geely want to take Lotus? Lotus is a benchmark for handling, aerodynamics and lightweight. I'm fairly sure with the Geely parts bin at our disposal, we can design a Lotus crossover that has unique lightweight features, aerodynamics and handling that befits the Lotus brand. What's driving your plan to expand beyond sports cars? We are not just tied to sports cars, which is a fairly stable market worldwide. What is growing at double-digits, however, is the SUV market, especially the premium SUV market. Would the SUV platform use bonded aluminum like your sports cars? Why should it? Bonded aluminum for sports cars is a great thing, and for the coming years we will certainly stick with that technology because we are masters at it. On other segments we can have steel, aluminum, composites or even carbon fiber. The future's wide open. MAIN CHALLENGE: Expand into SUVs while keeping the Lotus DNA intact. Will Geely use your engineering arm? Lotus Engineering has lots to give to our shareholders as well. It's one of the reasons Geely bought us. Lotus made a pre-tax profit in the second half of its last financial year. When will the company achieve full-year profitability? Next year is clearly the plan. The target is to be cash-flow positive for this financial year. Lotus hasn’t been cash-flow positive for a couple of decades. One of the reasons Geely bought us is because Lotus has also managed to survive in a really tough automotive industry. How have you improved cash flow when sales have been flat? Last year's sales were 1,500 and this year they will stay about the same. However, revenues are up 15 percent because we're selling much higher-spec cars. In each of our product lines, the car with the highest horsepower is the best-seller. In addition, we are still reducing costs. In our next financial year [which starts April 1, 2018], we will enter the Chinese market with the Evora 400. Could the Esprit supercar come back? I can't divulge any future plans, but in the next six months we will announce some future projects. I am convinced the Esprit is an extremely good brand name. Has Geely given you a sum to spend on developing new cars? No sums are disclosed. We're working on an exciting five-year plan with our new shareholders. What you won't see us doing is launching five new cars at a motor show. Where will the new cars be made? Our sports cars will stay in the UK, that's clear. Lotus is quintessentially a UK brand so we need that. If, in the future, we have one or two plants for the potential crossover, they should be close to where the destination market is. For SUVs, the biggest market in the world is China. That’s where Geely has plants. But, I don't exclude anything at the moment. Besides SUVs, are there any other segments Lotus could enter? We're currently doing an analysis and there might be more segments where the Lotus DNA could be used. But for crossovers I'm not just thinking of one size, but a couple of sizes. Do the SUVs have to be compact? Lightweight doesn't mean small. It means efficient. It means intelligent engineering. It means using the right materials, with a low center of gravity for the right handling. We have ideas on how to achieve that. Would it be hybrid? Electric? There are trends leading toward electrification and all future Lotus cars will show some form of electrification. Maybe the sports cars will stick with combustion engines. If it isn't lightweight, however, we're not going to do it. How has the pound's declining value affected Lotus? On balance, it's slightly positive. Currently 70 percent of our parts are sourced locally, one of the highest in the UK, and we export 80 percent. What are your fears when the UK leaves the EU in 2019? If you get into a full WTO [World Trade Organization tariff] situation, everything gets more expensive. There's no way out of that. I am willing to increase UK-sourced components above the 70 percent, but at the moment there's a lot of talk of support [from the UK government] but not a lot of commitment.